Check out my reviews of Cinder, Scarlet, Cress and Fairest! This review will be spoiler free, but I recommend you not reading this if you haven't already read the other books in the series! It's here! My most anticipated read of 2015 is here! Anyone who's been following my blog for a while - and anyone who knows me in person - will know that I adore The Lunar Chronicles; it's up there with some of my favourite series, tucked in snugly beside Harry Potter, and now that it's come to an end I'm at a bit of a loss. I at least have the release of Stars Above to look forward to next year! Winter takes place entirely on the moon, and follows Cinder and co. as they attempt to overthrow Levana and liberate her people. 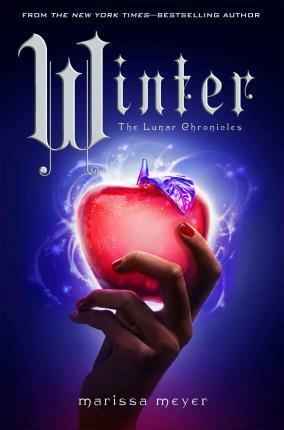 Along the way they find an ally in Levana's beautiful stepdaughter, Winter, whose refusal to use her lunar gift has been nudging her towards insanity since her childhood. What a conclusion. At 800+ pages, Marissa Meyer had a lot to do in this final book; not only did she have to tackle the entirety of her Snow White retelling, but she also had to wrap everything else up, so I'm not surprised it ended up being as long as it is. I was quite happy with that, though - the more scenes set in this world the better, because I love these characters! In fact the scenes in which Cinder and her group were together were my favourites, and have always been my favourites; I adore Cinder's friendship with Thorne and Iko, and it was nice to see more of Kai, too. We certainly saw quite a bit of him in Cress, but it was nice to see him finally able to directly help them out. I was really looking forward to meeting Winter after the glimpses we got of her in Cress and Fairest, and I loved that Marissa Meyer didn't try to tone down her crazy. This poor girl is losing it - seriously losing it - but she's also very endearing, and quite cheeky. Yet again, Meyer has presented us with another heroine who feels entirely different from the other three, and another completely different romantic relationship. Jacin was a lot more likeable in this book than he was in Cress, though sometimes I did find his and Winter's relationship a little annoying; I could completely understand the two of them wanting to keep each other safe, but sometimes they were willing to risk the lives of literally thousands of other people if it meant the other was okay. Yeah, I guess we could argue it's romantic, but considering they're currently living on a planet where the ruler is tyrannical and corrupt it was also slightly selfish. I just wanted the two of them to think outside of each other a little more! One of the relationships I really enjoyed was the friendship that developed between Scarlet and Winter. The two of them made for a pretty great duo, and given how much Jacin coddles Winter I think she needs someone like Scarlet. I would have liked to have seen a few more scenes between her and Cinder, though, given their close friendship when they were children. Thorne and Cress are as adorable as usual - I love Thorne, and I definitely have a softspot for Cress - but what surprised me most was how much more I enjoyed Scarlet and Wolf's relationship in this book. I don't dislike either of them, but Scarlet is my least favourite book in the series because there's something quite instalove-y about their relationship and I really don't like instalove. In this book, though, I believed their relationship a lot more, and I looked forward to reading scenes that involved the two of them. In fact I really, really enjoyed Wolf's journey in this book, and I think Meyer was quite brave in the decisions she made regarding him. But that's enough about the characters - however much I love them - what about the story itself? Well, first of all I have to say I loved how Meyer incorporated the story of Snow White into a sci-fi setting. As always, there were so many tips of the hat to the original tale; the poison comb, the poison apple, the number seven. Meyer fills every single one of her books with little fairy tale Easter eggs, and I think they'll make rereading these books in future a joy - I feel as though I'll notice something new each time I read them. I don't think Winter was perfect, but the last book in a series is always so difficult to get right. I don't think there was anything wrong with the book, but there were a few little bits here and there that I think could have been improved just a little; sometimes Cinder didn't sound like Cinder anymore, she sounded like a lost princess when I wanted her to sound like the mechanic from New Beijing. I also felt as though the final battle between her and Levana was ever so slightly underwhelming, but it's important to note that I didn't dislike the book - I think you can tell from my rating that I didn't dislike it at all. Ultimately I think Meyer did a fantastic job of tying everything up and linking everything together. Sometimes Cinder made dumb decisions, and the group were pulled apart and pushed back together and hurt and healed and all sorts, but I wouldn't expect a revolution to go smoothly. I was pleased to see that Meyer didn't make it easy for them! I love this world and these characters so much, they have a very special place in my heart, and I'm going to feel lost without them. Bring on Stars Above! Adult Fiction for YA Readers! The Book Bloggers and Books Tag! Sci-Fi Month | Is Alien Gothic?